In response to the onslaught of the Typhoon Yolanda that left many homes devastated last November 8, 2013, the Commission on Human Rights (CHR) partnered with MLAC Psychosocial Services for Well-being to provide their employees and their families with psychosocial support. So far, two group trauma therapy sessions were provided to the employees of CHR- Region 8, covering the areas of Leyte and Samar. CHR transported their employees to the island of Cebu and housed them in St. Mark’s Hotel, where they were provided trauma therapy by the MLAC team members. 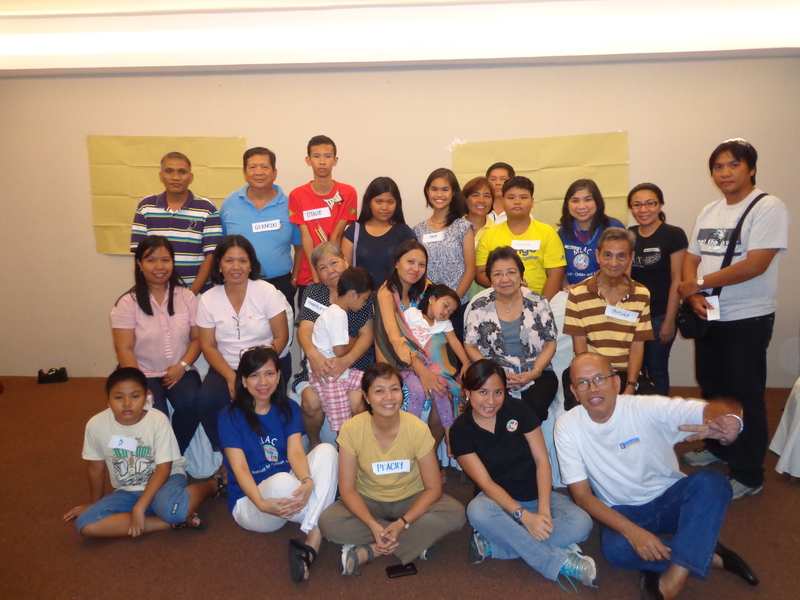 Last December 19-20, 2013, the first batch of CHR Region 8 employees and their families were provided trauma therapy sessions by MLAC team members. A total of five CHR families and their employees were guided in their journey to recovery by MLAC members Rachel Parr ,Marisa Marin, Queenie Cezar, and Peachy Gonzales, with me as their documentor. 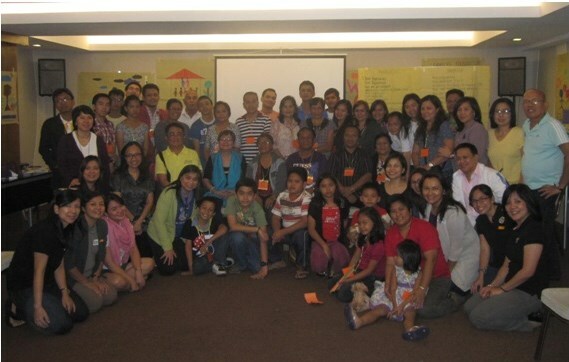 MLAC members with the CHR Region 8 employees and their families after the fruitful two-day session last December 19-20, 2013. The second group trauma therapy intervention was conducted last January 28-29, 2014. This was a larger group of families, comprised of almost 60 attendees. To ensure the quality of the processing sessions, a larger group of MLAC facilitators also came to the sessions, namely Marisa Marin and Rebecca Gerodias for the children, Queenie Cezar and Chris Carandang for the adolescents, and Aileen Sison , Rachel Parr, Fiona Sandoval , Wash Garcia, and Peachy Fernando for the adults. Dr. Maria Lourdes “Honey” Carandang also came with the group to provide the input on trauma and to answer the questions of the adults regarding their experiences and also help the facilitators in integrating the key lessons learned from each of the participants’ experiences. The entire program for the children was documented by Anna Lopez, while I was assigned to document the program for the adults and adolescents. Tita Honey and MLAC team members with the CHR Region 8 employees and their families post the very successful session last January 28, 2014. Many lessons were learned during both sessions. Please watch out for a more complete write-up of the insights gained from these two activities in the coming week.